Sea Cutter is the first of the new cabin model M-23. Her first owners were Fred and Lilly Shelly of Arizona took delivery of their special ordered craft in September of 2003. They got to busy to spend much time with her not really breaking her in with a real shake down until this past 2005 MSOG San Juan and Gulf Islands Cruise. To make this cruise, they towed Sea Cutter behind their one ton Dodge Diesel pickup. Fred says the truck is a bit overkill for just the boat, but they frequently take along the cabover camper to use when the boat is on the trailer. Mast raising was at first a real concern for Fred until he created an A-frame to keep the pole centered while going up. Now, it's a one person job, but Fred feels it's safer with Lilly's help. Because of conflicting schedules and lack of time, Fred and Lilly have not been able to sail as often as they would like to. As a result, she's been sailed mostly as a sloop. Photos and Story by Fred and Lilly Shelly. 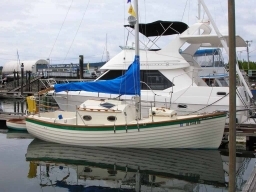 Sea Cutter was sold in ~2012 and moved to British Columbia, Canada.